The Crypto Wallet sidebar panel syncs with your Opera for Android Crypto Wallet. 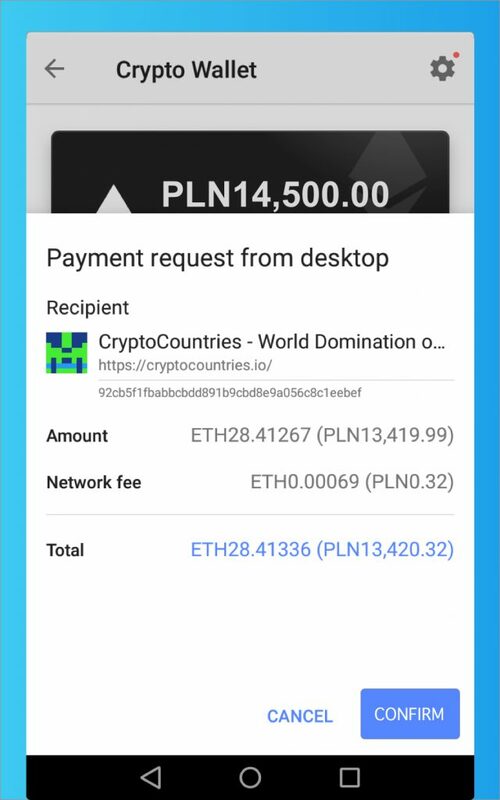 You can make transactions with the Crypto Wallet sidebar panel on Opera for computers and confirm the payment with your Opera for Android browser. Your keys, collectibles, and tokens in your Opera Crypto Wallet are accessible on both Opera browsers for computer and Android. Your wallet keys and its backup phrase never leave your phone and remain secured by your phone’s on-device storage. 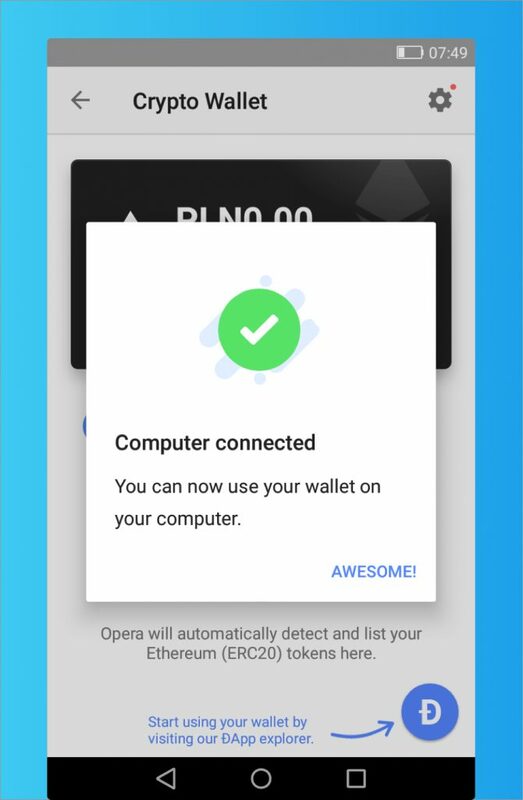 Before using the Crypto Wallet sidebar panel in Opera for computers, you will need to create your own Crypto Wallet in your Opera for Android browser. On your Opera for Android browser, go to Settings. Your Crypto Wallet is ready. Simple! You will now be able to access it directly from the main menu (Opera button). A 12-word backup phrase, also known as a seed phrase, will be created for you. You will use this phrase to sign back in to your Opera Crypto Wallet. It is very important to keep this phrase safe and secure. Opera will never ask for your backup phrase. Should you ever lose your phone or have your phone stolen, therefore preventing you from accessing your wallet, this phrase can be used to restore your assets in a new wallet. How do I connect my Opera for Android Crypto Wallet to Opera for computers? First, you need to add Crypto Wallet to Opera’s sidebar. To add Crypto Wallet to Opera’s sidebar, click the Easy Setup button in the far-right edge of the toolbar. Then, under Features in Easy Setup, click Crypto Wallet. Crypto Wallet is now in your sidebar. Next, open the Crypto Wallet sidebar panel and click Reveal the code. Scan the revealed code in the Crypto Wallet sidebar panel with your Android device. In the Crypto Wallet sidebar panel, you will see your wallet’s funds, tokens, and collectibles. You can now use your Opera Crypto Wallet on your computer. Awesome, indeed! How do I make a transaction with my Crypto Wallet on Opera for computers? 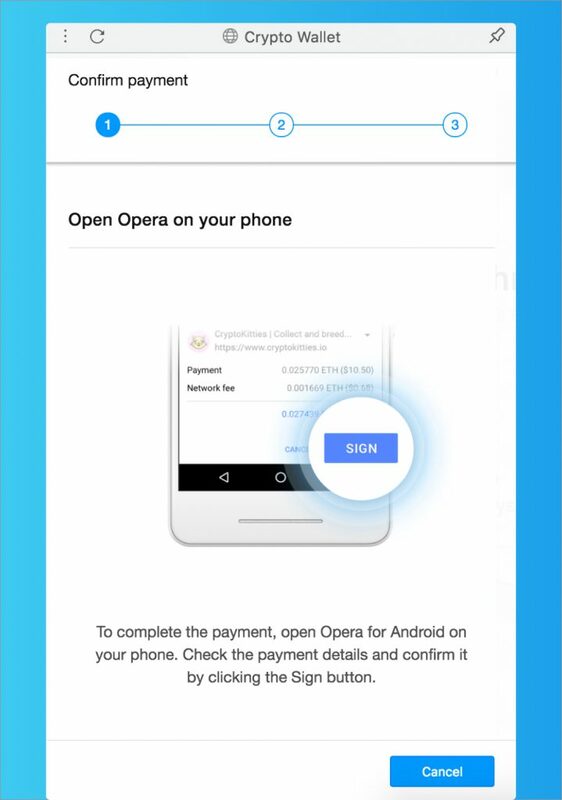 All transactions made with your Opera Crypto Wallet, whether by purchasing something or sending to or receiving from another person, must be confirmed with your Opera for Android browser. This acts as a two-step verification process to help protect your funds and keep your wallet keys secure. When you are ready to make a transaction from Opera for computers, the Crypto Wallet panel will open and the payment confirmation process will begin. 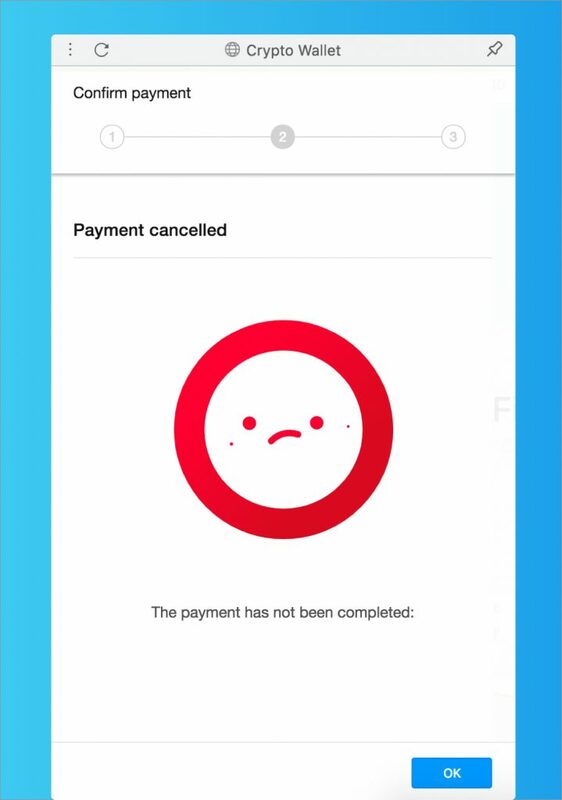 To continue the payment process, open your Opera for Android browser. If your wallet is properly synced, the mobile browser will open the payment confirmation page. Here you can review the details of the pending purchase. To continue with the transaction, tap Confirm. After tapping Confirm, you will be asked to perform your device’s system unlock procedure. The payment process is complete. If the purchase is unsuccessful, you will see the screen shown below on your computer browser. You will need to reattempt the purchase. How do I receive Ethereum (ETH)? In order to receive Ethereum from a sender, you will need to share your wallet’s address with them. In the Crypto Wallet sidebar panel, click Copy Address to copy your wallet’s address on your clipboard. 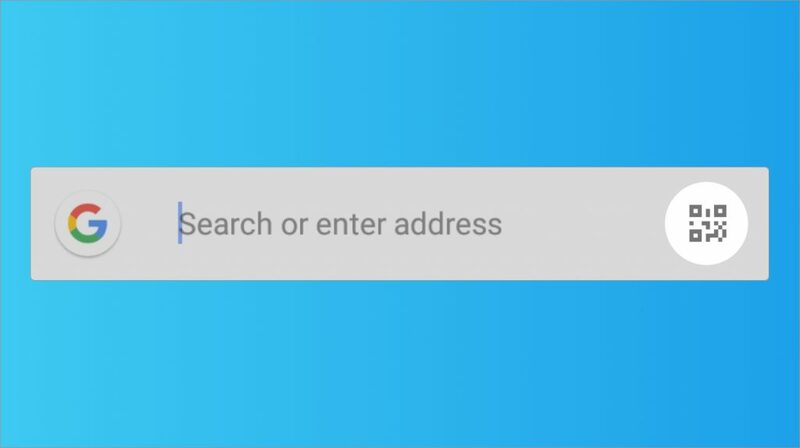 You can now paste the address in any send/receive form. What is Opera’s dApp explorer? The Opera Crypto Wallet provides a direct link to the Opera dApps Store. 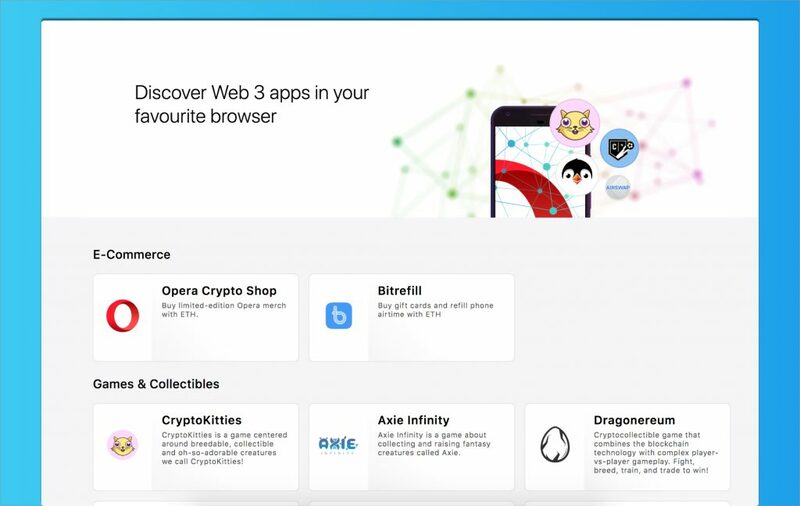 Here you can discover Web 3.0 apps such as CryptoKitties, Bitrefill, and other Ethereum-based marketplace and social applications. 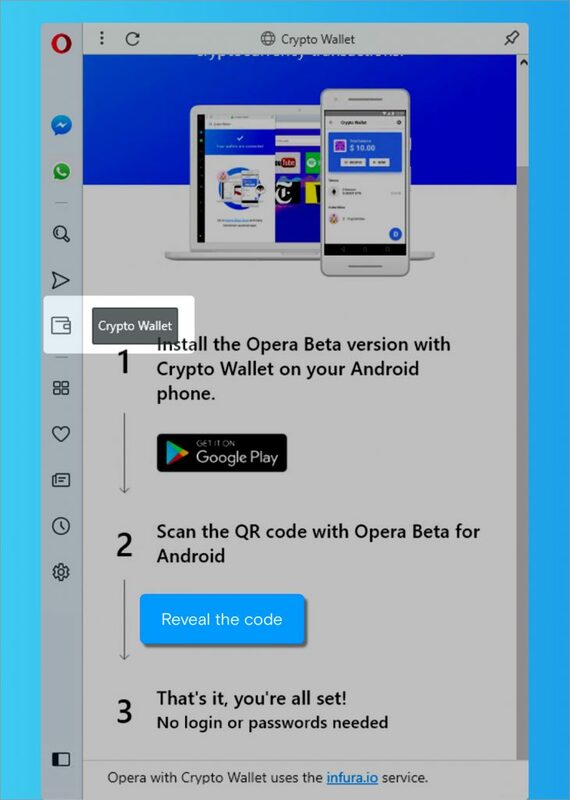 To open the Opera dApps Store, open the Opera Crypto Wallet sidebar panel and click the blue dApp button in the bottom-right corner of the panel. Have other questions about Opera’s Crypto Wallet? Please visit our Opera Crypto Wallet FAQ page if you have additional questions about the built-in wallet.